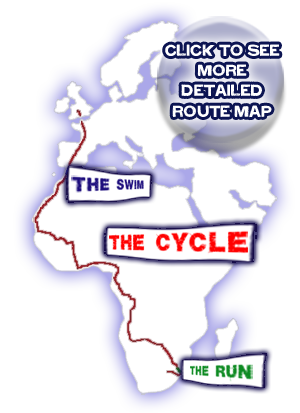 Tri4Africa | Rob Forbes is running, swimming & cycling his way from the UK to South Africa 2010 in this epic triathlon. My name is Rob Forbes and this website will follow my progress as I swim, bike and run my way from Cirencester to South Africa to support England in the 2010 World Cup. Done 12 June 2010 ... See Mission Accomplished! With only 8 months to complete this epic triathlon it promises to be an incredible physical and mental challenge. I hope to raise a £1 per km - £20,000 - of the journey for the charity Re-Cycle who provide bicycle aid to Africa. I plan to visit a number of the charity's projects en route and conclude this journey of a lifetime by visiting their project based in Cape Town, Johannesburg or Lesotho. (England Fixtures dependent). Please donate to this great cause by clicking here, 100% of donations go to the charity. Re~Cycle's mission is to collect secondhand bicycles and ship them to Africa. Their partners distribute bikes and teach riders the skills to repair and maintain them. Their bikes also help health/AIDS workers reach remote villages and even provide an ambulance service in remote Namibia.